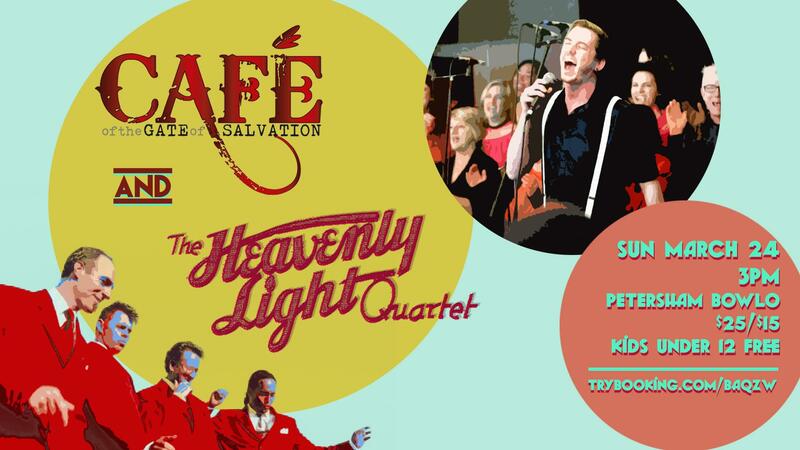 Enter gospel heaven at the Petersham Bowling Club when Cafe of the Gate of Salvation meets the Heavenly Light Quartet. The Cafe is delighted to be sharing the stage with the legendary Heavenly Light Quartet at a very special afternoon performance at the Petersham Bowlo on Sunday 24 March, starting at 3:00pm. Be uplifted by the Café’s energy-filled and soulful music from the African-American vocal tradition. We sing because we love to share our voices, to foster inclusiveness, passion and joy. The Heavenly Light Quartet digs up the roots of Soul and RnB music - reviving in detail and in spirit the Black Gospel a cappella music of the male gospel quartet during the ‘Golden Age’ of Gospel (1940-1960). The HLQ set out to explore the intricate, rhythmic and fiery songs by the classic, great Gospel Quartet groups like the Dixie Hummingbirds, the Swan Silvertones, the Spirit of Memphis Quartet, the Soul Stirrers and the Golden Gate Quartet. It’s a unique gathering of two amazing groups formed by Tony Backhouse, in 1986 (Café) and 1996 (HLQ), with Tony performing with both! The HLQ and the Café will each perform a set, and will join together at the end to go out with a blast. This is an event not to be missed - tickets are selling fast so you'd be wise to book soon.